It’s been a wonderfully busy Spring with several great school visits, reading Dot books with first and second graders. Plus some super fun drawing and coloring! Bjorn was invited to read with a large group of students at Periwinkle Elementary for the second year in a row to celebrate Read Across America Day, on Monday March 2nd. This time, Bjorn read to an assembly of K-2 students. Lots of great questions and observations. Thanks again to the special efforts of Mercedes Strowbridge, Periwinkle’s reading specialist. Next, Bjorn visited several first and second grade classes in March at Bridlemile Elementary, for some reading and a creative exercise that encouraged the children to create their own pictures about what they think Dot like to do. Apparently Dot likes to do KungFu, make new friends, and dance! Special thanks to Bridlemile’s Tom Finch for his support and coordination of so much fun reading! And most recently, on April 16th, Bjorn was invited to Vose Elementary to read with 4 first grade classes. 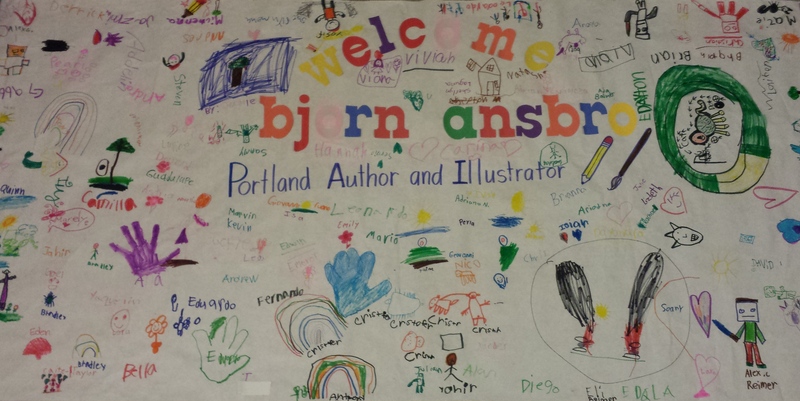 Sandy Reimer and the children welcomed Bjorn with this beautiful banner!!! So many bright, engaging children with great questions like, “What is Dot?” and “How does Dot move?” Loads of fun! And everyone enjoyed finding Nibbles (the super secret spy bunny) hidden throughout Dot Wonders. Next, Bjorn is back at Bridlemile on April 24th to encourage more reading and creative expression!